This film is composed of 3 separate vignettes by 3 of the greatest directors of our time. I first saw it in 1990 when it was on the shelf at a local library in Maryland, where I was living at the time. I have not seen it anywhere since then; certainly never on television, cable or otherwise. This copy turned up at a used book store in South Charlotte, and for the princely sum of $4 I took it home. The first of the vignettes is called “Life lessons” and stars Nick Nolte; before the infamous mug shot; as a crazed and passionate artist named Lionel Dobie. He feeds off of his assistants in a never ending cycle of narcissism. As an important exhibition nears he finds himself unable to paint as he battles for the affections of his assistant Paulette; played by Roseanna Arquette; with whom he is besotted. Complicating matters is her relationship with Steve Buscemi, who plays a scheming performance artist. The relationship between Nolte and Arquette forms the core of the story, until she leaves and he continues the cycle with his next assistant. This film was directed by Martin Scorsese. “Life without Zoe” is directed by Francis Coppola. It is the story of a young named Zoe; played by Heather McComb; a girl left to raise herself while her parents travel the world. When they come home she is the one with the routine; the de-facto parent. Her parents are worldly and successful in their separate careers, but it is Zoey who is really the only thing that holds them together. In the end you have to wonder if they need her more than she needs them. There is also a sub plot in which she helps to return a piece of stolen jewelry which was given to her father to its rightful owner; an Arab Prince. This film shows a side of Manhattan that still exists today; the world of money and privilege to which we would all love to belong; or maybe not. 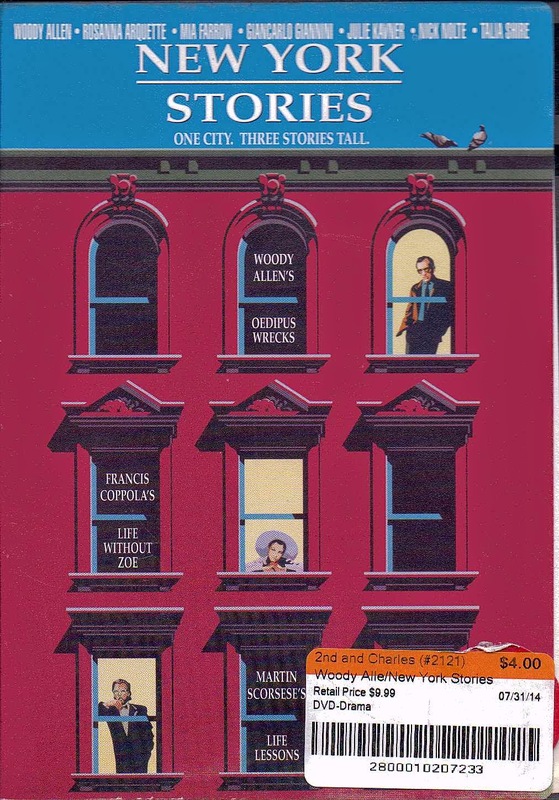 Woody Allen’s offering is “Oedipus Wrecks” starring Mr. Allen, as Sheldon, and Julie Kavner, as a psychic named Treva , before Marge Simpson; and with Mia Farrow as his fiancée; before the sordid allegations. Mr. Allen basically plays himself as a neurotic man. When his deceased mother won't leave him alone he complains to his shrink. When he gets engaged to Mia Farrow his mother takes to the skies above the city to enlist the publics help in stopping her son from ruining his life. When he sees a psychic to try and deal with his mother, he finds that he like her, and soon finds himself in a relationship with a woman who not only understands him, but also becomes friends with his mother. And though his mother may approve of the girl, how does that affect his perspective of the relationship? This is the type of Grade A comedy and wit you expect of Mr. Allen. Just scratch past the surface and I believe there is more than a bit of auto-biography going on here. This is a wonderfully creative effort by 3 great directors who normally create feature length films. For established professional like these three, working within a limited time frame can sometimes be a liberating thing.